President Buhari decorating the new Inspector-General of Police, Abubakar Adamu Mohammed, at the State House. “We are professionals. We are going to stick by the rules. We are going to do the right thing. We will not go outside the ethics of our job to do things that are untoward. Everybody will be given a level-playing ground to play his or her politics,” he said. In a statement by its spokesman, Kola Ologbondiyan, yesterday, the PDP urged the officer to “avoid the pitfalls of the last IGP, who has gone down in history as the most corrupt, devious and reckless police officer to hold the post.” It further advised him to remove all templates of election rigging contained in the handover note that would be presented to him by Idris. 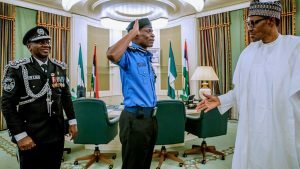 In another reaction, pro-democracy group, Human Rights Writers Association (HURIWA), issued a statement asking the new IGP to change the public relations dynamic of the institution from a “lying force” to a people-friendly agency.